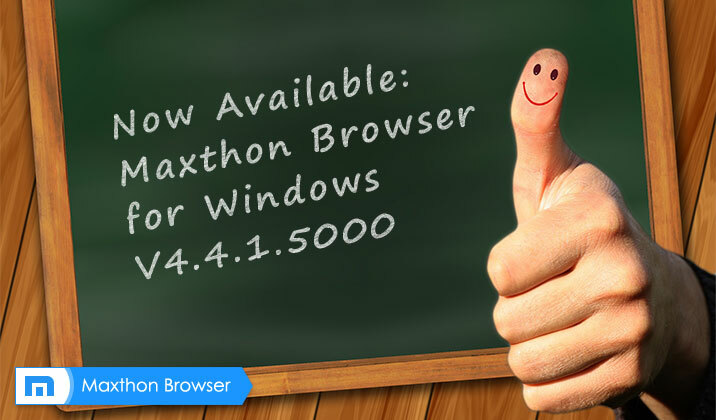 Today, we are thrilled to announce the release of the 4.4.1.5000 Final version. This final version aims to fix some crash problems. Please try it out and let us know if you have any comments or suggestions. * Unable to visit certain domain names, such as ‘.club’ etc. To better and more efficiently solve the problems you meet during the usage, for any suggestions or bug reports, we do hope you may go to’ Product Support‘ area and report/describe by a new separate thread for each problem/topic. We will read each thread and update the follow-up status then. Meanwhile, some problems are probably be left out if they are stated in other thread. When will block ads by click be enabled? Its a much needed feature! 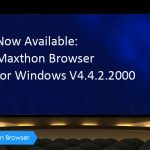 After the update to Maxthon v4.4.1.5000 I’ve found it reloads Microsoft Sharepoint web pages until it crashes the page load. Hope this is useful to know. it will be good to have option to cycling to last used tab, like with ctrl+Tab in old/new opera or alt+Tab in windows – cycling the present and last used tab/window. there’s still no such option in settings.